Most everyone has had at least one point in their lives when money was needed fast. For a few, the reasons for this urgent need stem from some sort of unexpected event , like emergency home repair, car accident, or sudden illness. For others, it’s the money needed to cover every day living expenses like food or rent. When cash is needed desperately — like for a rent payment or a utility bill — and there’s no time to get a secured loan or an unsecured loan, many people turn to payday loans. Payday loans, or cash advance loans, are a form of short term loan that’s tied to a paycheck. The way it works is that in borrowing the money from a payday loan company, the borrower writes a check for the amount they want to borrow plus any fees. The loan company then holds onto the check until the money, plus fees, is due. For these types of loans, that due date is when the next paycheck is scheduled for. When that date arrives, the lender collects payment by depositing the check. While that sounds simple and convenient, many borrowers find themselves in a position where the loan is rolled over or renewed, many within two weeks. A recent study by the Consumer Financial Protection Bureau (CFPB) shows that four out of five payday loans are rolled over, leading to a cycle of debt. Further, these borrowers wind up paying more in fees than the amount the loan was originally for, putting them even farther behind. Pew Research found in their study that the majority of payday loan borrowers make less than $40,000 a year — that, in combination with the trend toward payday loans being rolled over or renewed, leads to those borrowers being indebted for five months out of the year. Pew Research also found that tax season is especially popular for payday loans as the expected tax refund is looked at as a way to pay off the loan and fees without having to solely rely on the next paycheck. 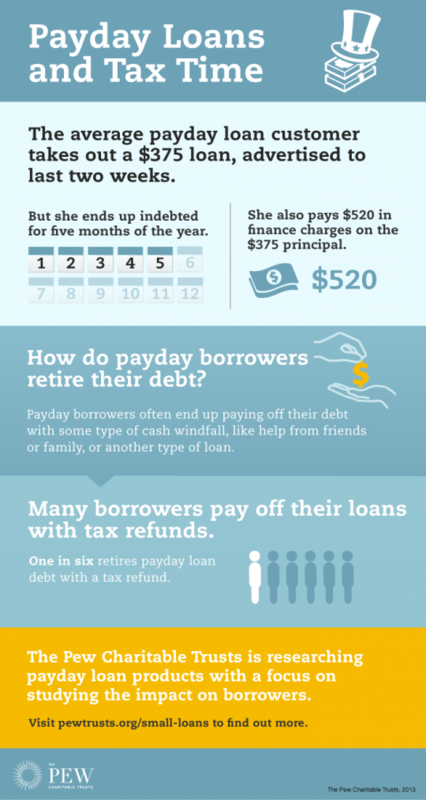 The following infographic from Pew Research offers a look at how payday loans work and why using a tax refund against these loans is popular. Hey I am so glad I found your website. There is certainly a great deal to find out about this topic. I love all the points you have made.